From inviting Duterte to the White House, to signing a “Free Speech And Religious Right” executive order, here’s everything Trump did this week. 1. Ended Michelle Obama's Let Girls Learn program. RT if you prefer our tax dollars were used to fund the "Let Girls Learn" initiative instead of to pay for Trump's weekly golf outings. 2. Threatened to terminate the United States's trade agreement with South Korea. 3. Suggested the government could use "a good shutdown." 4. Gave Jared Kushner another job. "Per an executive order signed Monday morning, Kushner and two deputies are launching a group called the American Technology Council, a joint effort between Silicon Valley and the White House to 'transform and modernize' how the federal government 'uses and delivers digital services,'" VICE reports. 5. Referred to Kim Jong Un as "a pretty smart cookie." 6. Cut off an interview with CBS's "Face Of The Nation" after not answering a question about his wiretapping claim. 7. Had a "very friendly" chat with Philippines dictator Rodrigo Duterte. Trump invited both Thai Prime Minister Prayuth Chan-ocha and odious Philippines dictator Rodrigo Duterte to the White House. "Now, the administration is bracing for an avalanche of criticism from human rights groups," the Times reports on Trump's call to Duterte. "Two senior officials said they expected the State Department and the National Security Council, both of which were caught off guard by the invitation, to raise objections internally." 8. Read the lyrics to "The Snake" at his 100-day rally, again. "It worked for Trump during the 2016 campaign. For many of his voters, 'The Snake' perfectly encapsulated their views of undocumented workers: Sneaking into the US under false pretenses and then immediately turning on the same people whose country they had entered. Trump stoked this idea by regularly citing heinous crimes committed by people who had come to the country illegally," CNN reports. 9. Gave literal Nazi Sebastian Gorka a job outside the White House. "Gorka's new role will deal with the 'war of ideas' involved in countering radical Islamic extremism, a senior administration official said, and will entail an appointment to a federal agency," the Washington Examiner reports. 10. Set aside a casual $61 million for non-White House Trump protection. 11. Tried to tell us we don't know our U.S. history. 12. Said the words, "Why was there a Civil War?" 13. And said that if Andrew Jackson hadn't died before the Civil War, he wouldn't have "let it happen." Reminder: Andrew Jackson instigated a genocide of Native American people and owned a lot of slaves. 14. Allegedly "negotiated" a "spending deal" for these useless pieces of trash. 15. Switched on a missile defense system in South Korea. 16. Appointed homophobic Tennessee state senator Mark Green as Army Secretary.
.@realDonaldTrump’s nominee for Army Secretary – Dr Mark Green – has made hateful & ignorant comments about our fellow Americans. Back in 2015, Green said: "The person who's in need … they look to the government for the answer, not God, and I think in that way government has done an injustice that's even bigger than just the creation of an entitlement welfare state. In this setting, I'll share the story, I think it interrupts the opportunity for people to come to a saving knowledge of who God is." 18. Wished, again, that he was enjoying his "previous life." At National Day of Prayer event, Trump says if he hadn't won the presidency, "I'd be out enjoying my life." 19. Signed a "Free Speech And Religious Liberty" executive order. That "Free Speech" part sounds an awful lot like something Richard Spencer and his white supremacist trolls might say. 20. Pushed a revised version of the AHCA bill (aka Obamacare repeal), this time allowing sexual assault (among other things) to be considered a pre-existing condition, through the House. 21. And then celebrated with a lame party. 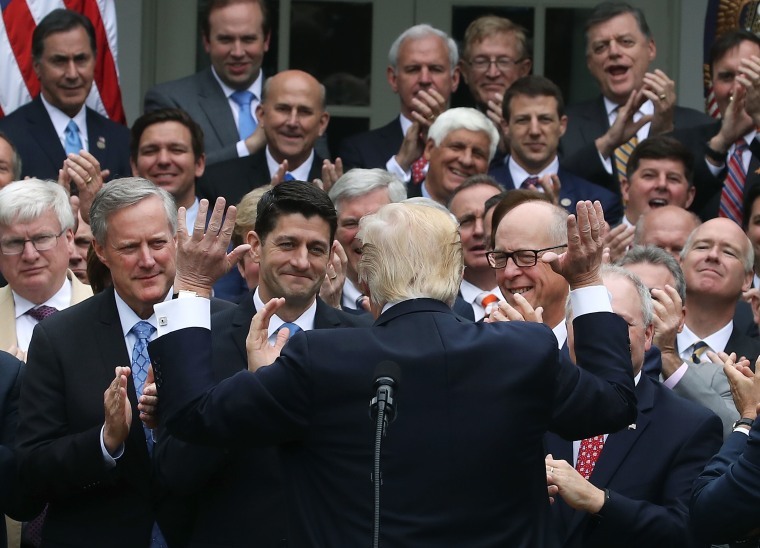 They celebrated passing a bill that would take healthcare away from 24 million people. Celebrated. 22. Returned to New York for the first time since the inauguration. Trump was met with protests when he arrived at the Intrepid Sea, Air and Space Museum. "By midday, the stops at the Peninsula and Trump Tower had been dropped from the schedule, and the trip had been shortened to Mr. Trump’s appearance aboard the aircraft carrier, his feet barely touching New York soil," the Times reports. 23. Where he met with Australian Prime Minister Malcolm Turnbull, and told him Australia has better healthcare than the U.S.
Trump tells Australia prime minister — "you have better health care than we do." 24. Proposed cutting 95% of the budget for the Office of National Drug Control Policy. So much for making America safe again!